When Pancho Villa, upset at American policy, invaded New Mexico in 1916, it was the last straw for President Woodrow Wilson, who dispatched an American Expeditionary Force under General John “Blackjack” Pershing. Among the 5,000 men Pershing led south was Lieutenant George S. Patton, who raided the San Miguelito Ranch in Chihuahua while looking to buy corn, learned that Julio Cardenas, one of Pancho Villa’s lieutenants, was nearby. Patton and his 15 men in three touring cars, when they came upon Cardenas and two of his soldiers. They shot the Villiaistas. Patton then strapped them over the hoods of the cars like deer! This was one of the last actions of the expedition. Patton always remembered it, carving three notches into his twin pistols, and earning the nickname “Bandito” from Pershing. Blackjack had undertaken the expedition just a year after the tragic death of his wife and three daughters in a fire at the Presidio in San Francisco where they were quartered. Only Pershing’s six-year-old son survived. 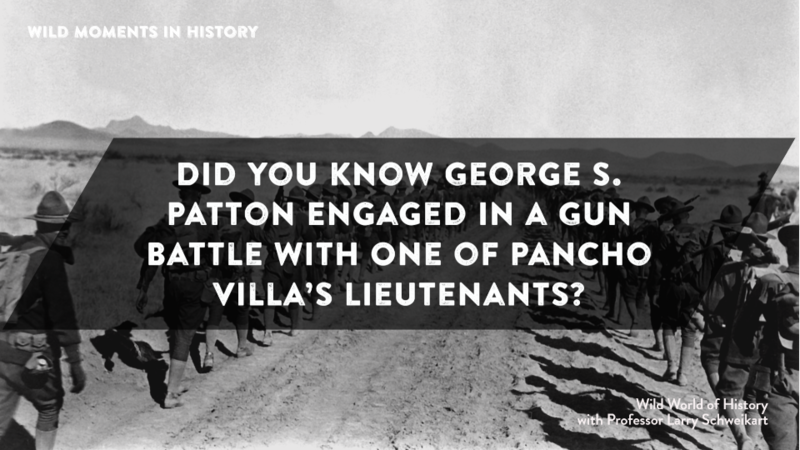 Two years later, Pershing would date Nita Patton, the George “Bandito” Patton's sister. For further reading, see John J. Pershing and John T. Greenwood, My life before the World War, 1860-1917.